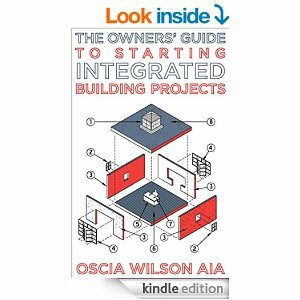 My first impression after reading The Owners’ Guide to Starting Integrated Building Projects by Oscia Wilson is that it is much more than a guide for building owners. This easy to read handbook will guide anyone interested in either pursuing this important and still little used collaborative project delivery approach – integrated project delivery or (IPD) – as well as those interested in gaining a better understanding of its methodology, to be better informed and prepared to explain it to others. The book has its roots in social media, in that it originated as a LinkedIn discussion, with many expert voices adding their two cents to the discussion. It soon became apparent that what was needed was an IPD users manual, and after some toil, as the discussion grew and grew, this must-have book was born. San Francisco architect Oscia Wilson envisioned turning the outcome of that very valuable online discussion onto a much needed owner’s guide, several integrated project delivery experts volunteered to contribute, and what ensued – the book I hold in my hand – turned out to be much more than the sum of its parts. Wilson wisely kept the length of the book down – it can easily be read in one or two sittings. Owners are busy people, and they want to get to the goods, the facts, sooner than later, so keeping the book slim was probably a wise choice. That said, the book maybe could have used more of a preface or introduction, to provide a little background – explaining, for example, why there’s a need for an owner’s guide (owners most often decide on the project delivery method for a project) and why not an architect’s guide or contractor’s guide. Also, for all of the rich content and comprehensive covering of topics, I was surprised that there wasn’t a mention of the several hybrid approaches to IPD that many firms have taken-up when IPD itself is not an option, including the so-called IPD-ish and IPD-lite workarounds which are pulled out when one can’t pursue IPD for legal or insurance (or just plain risk-aversion) reasons. Perhaps the author didn’t want to give Owners the option to duck out of using IPD pure and proper? That said, the book does have an excellent section on What To Do If You Can’t Do IPD which offers some excellent alternative approaches and tactics. If, like owners, the goods are what you are after, the book is chock full of excellent collaboration-related tips, techniques, talking-points and step-by-step processes. More than an owner’s manual, this book could be thought of as an IPD Users Guide which should appeal to a much wider readership. This easy-on-the-eyes book is itself a beautiful object – well worth owning for its considerable contents as it is for the attractive cover, the clear and well-illustrated color graphics, and the closing invitation to add to the continuing conversation. Everyone in the building industry will benefit from reading – and rereading – The Owners’ Guide to Starting Integrated Building Projects.